Prescribed burning is used to reduce the occurrence, extent and severity of uncontrolled fires in many flammable landscapes. However, epidemiologic evidence of the human health impacts of landscape fire smoke emissions is shaping fire management practice through increasingly stringent environmental regulation and public health policy. An unresolved question, critical for sustainable fire management, concerns the comparative human health effects of smoke from wild and prescribed fires. Here we review current knowledge of the health effects of landscape fire emissions and consider the similarities and differences in smoke from wild and prescribed fires with respect to the typical combustion conditions and fuel properties, the quality and magnitude of air pollution emissions, and the potential for dispersion to large populations. We further examine the interactions between these considerations, and how they may shape the longer term smoke regimes to which populations are exposed. 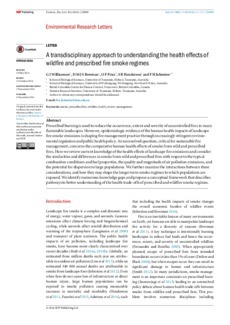 We identify numerous knowledge gaps and propose a conceptual framework that describes pathways to better understanding of the health trade-offs of prescribed and wildfire smoke regimes.